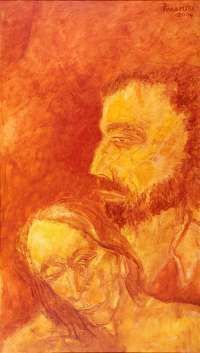 Akbar Padamsee was born in Mumbai in 1928 and was one of the early pioneer painters of the 1940’s to forge a new modernist style in Indian art. He passed out of the J.J. School of Art, Bombay. Contemporary of other young radicals, he, along with his other young artist friends like M.F. Husain, F.N. Souza, Tyeb Mehta, V.S. Gaitonde, went on to claim that they “invented modernism” for Indian art. By this they meant rejecting India’s past traditions and looking to the Paris School for inspiration. In his search for modernism Akbar left for Paris in 1951 and lived and worked there till 1967. In 1965, he received the J.D.Rockefeller III Fund Fellowship. He was Artist-in Residence at the Stout State University, Wisonsin and held a solo exhibition at the Musuem of Contemporary Art, Montreal in 1967. He returned to India the same year. He was awarded the prestigious Jawaharlal Nehru Fellowship for 1969-70, during which period he made four short films one of which was ‘SYZYGY”; based on a set of his animated geometrical drawings, and ‘Events in a Cloud Chamber’. Akbar, whether in his figurative works or in his abstract ‘Metascapes’, could be described as being both cerebral as well as sensual. While on one hand Akbar deeply probes the existential aspects of the “modern personality” with all its elements of stress, alienation and solitude -on the other hand, in his treatment of the human form, and in his handling of paint, one notices elements of great sensuality. It is these conflicting elements of both pain and tenderness, which makes his paintings visually beautiful and intellectually provocative. He is an artist whose work ranges from the figure to the non-figuration ... an artist difficult to bracket. In fact for Padamsee it not the bracketing which is of consequence, for his main pre-occupation is with the form, volume , space, time, & colour. He is very conscious of every mark that he makes the process of creation is one of contemplation and articulation of thoughts and ideas. "While working he has a blank canvas on which he tries out everything before applying it to the final one, the reason for doing so is that he wants to avoid error" - sums the whole persona of Akbar Padamsee and his works. Though very meticulous in his method of working, the colours in his paintings pulsate with throbbing energy, for he is a master colourist. The more familiar of his body of works are the "metascapes", " mirror images", (non-figurative), the figures & "heads", he keeps going back and forth between them. The metascapes are a development from the landscapes. The mirror images show his concern with the duality of existence, of form & space. The figure is treated not as an individual, not even in the heads where the association with portraiture is even stronger. The only occasion when he has handled portraits, is in 1997, with the Gandhi series, done on paper with water colours & charcoals. Padamsee's pioneering spirit has allowed him to experiment with a wide range of mediums: the gamut of the traditional ones, to the most recent of the additions of computer graphics. Whatever his chosen medium he conveys a command over use of space form & colour. Akbar Padamsee has held several solo exhibitions throughout his long illustrious career. He was invited to exhibit at the Venice Biennale-1953 & 55; ‘Seven Indian Painters’, Gallery One, London-1958; Sao Paulo Biennale, Brazil and Tokyo Biennale, Japan-1959; Galley ’63, New York-1963; Indian Triennale, New Delhi -1968; India: Myth and Reality-Aspects of Modern Indian Art’, Festival of India, Royal Academy of Art, London-1982; Artistes Indiens en France’, Foundation Nationale des Arts Graphiques et Plastiques, Paris-1985; Festival of India in U.S.S.R., Moscow - 1987; National Exhibition of Contemporary Art’, National Gallery of Modern Art, New Delhi-1991, ‘Ashta Nayak’, Tao Art Gallery, Bombay - 2001. 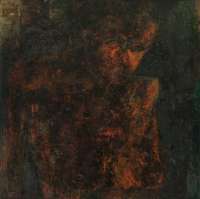 A retrospective showing of his works was organised by Art Heritage, New Delhi in New Delhi as well as in Bombay in 1980. He was awarded the Kalidas Samman by the Madhya Pradesh State Government for 1997-98. He is also a keen student of Sanskrit. Akbar Padamsee lives and works in Mumbai.